They have now gone five games without a victory. Madrid have now gone five games without a victory and by the time Marcelo gave them hope of a comeback at the Santiago Bernabeu, they had gone 481 minutes without a goal too. Lopetegui had cited a lack of luck in recent weeks and Madrid were not blessed with it here. They hit the crossbar twice and the post once. They suffered a two-goal swing as a result of the Video Assistant Referee, one against called as a penalty, and one ruled out for offside. “I’m sure football will eventually give back to us what it is taking away,” Lopetegui said. But a single goal, from their 30-year-old left-back, in over eight hours is no fluke, and neither are the defensive lapses that could have seen Levante add more to their early double. Paco Lopez took charge of Levante in March and oversaw eight wins from 11 to avoid relegation. This season they are now seventh, a point behind Madrid. Levante were two up in 13 minutes and both came from Varane mistakes. The first was more blatant as he misjudged the flight of Sergio Postigo’s through ball, allowing Morales to nick it round Thibaut Courtois and fire into the open net. It got worse as Varane handled and VAR advised the error had been inside the box. Roger converted the penalty. VAR proved their undoing again, ruling Marco Asensio’s follow-up offside after Casemiro headed against the crossbar. 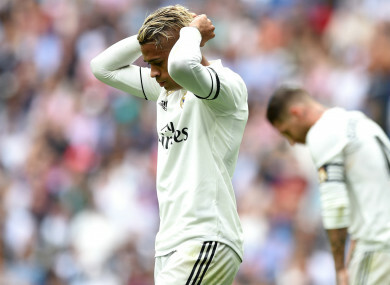 Mariano was also denied by the woodwork while Ramos and Lucas Vazquez missed from three yards. Lopetegui had thrown Bale on at the interval while Benzema and Dani Ceballos were introduced on the hour. Benzema shot straight at Oier Olazabal, who then pushed a bending Bale free-kick wide. Finally, Madrid scored, with that pair involved again as Bale flicked on to Benzema and Marcelo drove home. Madrid believed as Benzema struck the far post with a curling effort and Mariano thought he had grabbed an equaliser in the 87th minute. The striker, however, had strayed just offside. For Madrid, it was not to be. Email “Lopetegui on the brink as Real Madrid suffer abysmal home defeat to Levante”. Feedback on “Lopetegui on the brink as Real Madrid suffer abysmal home defeat to Levante”.